A tale of love across time and space: a cinematic experience not to be missed. "Your Name" (or Name/Kimi no na wa) follows his 2013 "The Garden of Words", which won the Satoshi Kon Award for Best Achievement in Animation and Best Animation Feature at the 17th Fantasia Film Festival. His first foray into the genre was in 1999 with the monochrome "She and Her Cat" (Standing Points) a five minute short award-winning anime about the relationship between a male cat and his female owner, told through the perspective of the cat. A massive hit in Japan and Asia on release, "Your Name" has since superseded Hayao Miyazaki's "Spirited Away" (2001) as the highest grossing anime of all time. 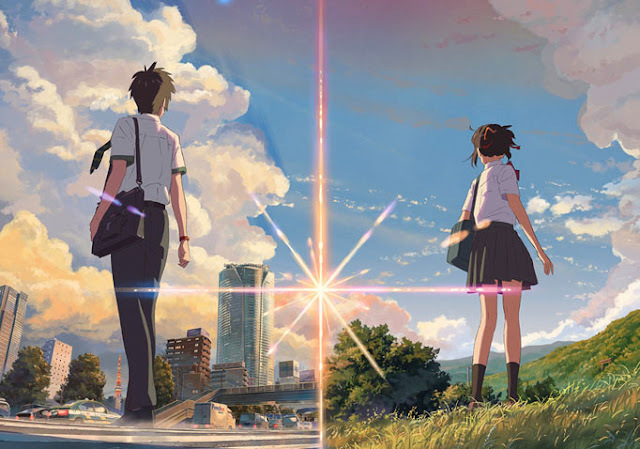 "Your Name" also garnered a number of awards for best animated feature including 71st Mainichi Film Awards and Los Angeles Film Critics Association Awards (2016); however, despite its critical and commercial success, it failed to be nominated for an academy award unlike "Spirited Away" which remains the only Japanese animated film to win an Academy Award. Anime Limited and National Amusements will screen "Your Name" in UK cinemas from 23 August 2017 in IMAX (the first anime to be shown in IMAX in the UK) with Japanese audio and English subtitles. and regular screens with both Japanese and English-language audio options. Like Makoto's previous anime including "She and Her Cat", "Your Name" presents us with a world that can only be known subjectively, through a character's perspective rather than an ontological reality that can be mapped and exists outside of that experience. 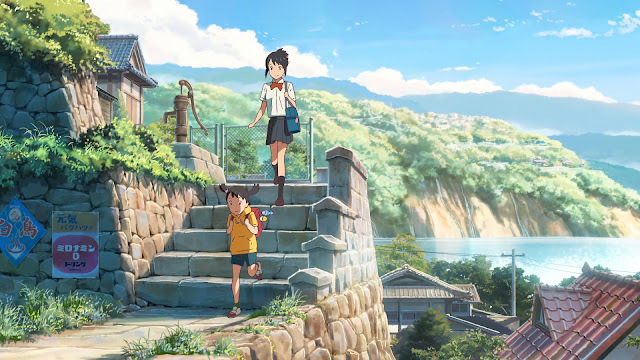 In "Your Name", we are offered two perspectives and realities through the use of the device of body swapping: the narrative is focalised through the experiences and lives of Mitsuha Miyamizu (Mone Kamishiraishi) a high school girl who lives in Itomori, a fictional small village in the Hida region of Japan, and Taki Tachibana (Ryunosuke Kamiki), a high school boy living in Tokyo. The use of body-swapping here is a mechanism through which to explore something much more profound than gender differences, which often exist solely for comedic purposes and end up reinforcing gender binaries and as a consequence heteronormativity. Instead, "Your Name" offers a type of gender fluidity in which gender is not the dominant mechanism through which identity is created and the world experienced. The body-swapping between Taki and Mitsuha frequently subverts gender norms - at one point, Mitsuha is disappointed that she isn't still in Taki's body for a date with one of the waitresses at the restaurant where he works part-time. Through inhabiting each other's bodies and lives, they transform beyond the limitations placed on them by both gender norms and those norms specific to their environments. The clash between tradition and the modernity, as epitomised by the two locations - one rural, the other urban; one attempting to retain traditions in the face of encroaching consumerist capitalism while the other fully embracing the postmodern techno-sphere, is as important a factor on identity formation as are gender norms.. The animation offers us a materiality which is made up of competing and contrasting textures: at times the diegetic surface is hyper-realistic, while at other times it is idealistic, nostalgic and fantastic. Like the red string of fate that binds Mitsuha and Taki together - both metaphorically and literally - Makoto refuses to privilege one way of life over the other, instead we are led to understand that the spaces and the times that those spaces inhabit are intertwined: that which may seem to have been lost exists just below the surface of the image, in the gaps between things, buildings, times and those that inhabit those spaces. Indeed, as we view those spaces through the double perspective of the insider and the outsider, we are offered multiple ways of seeing and through that, understanding of modes of being in the world tied to how time flows: in the city time flows quickly - temporal ellipses are used to speed up time as hours and days become seasons and then years, while in the village time passes slowly, unfolding in a much more naturalistic manner. The busy streets of Tokyo are contrasted with the empty spaces of Itomori. High angled and low angled shots are used to express the interaction between the self and the environment while panoramic tracking shots sweeping across the landscape intensify as the narrative moves towards its inevitable conclusion. Yet, as exceptional as the animation is, the film is not just about vision and the gaze. 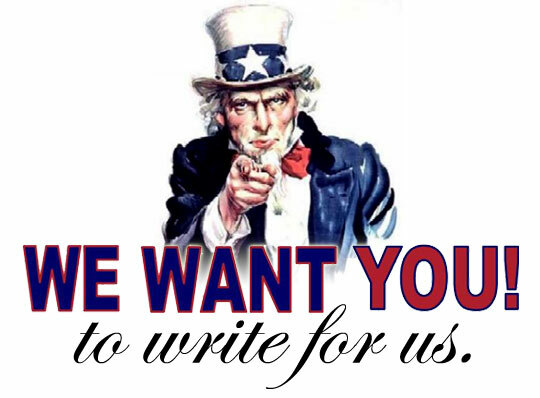 Instead, songs are used throughout the narrative to add texture to the image. The score by Indie Japanese rock group, RADWIMPS was written as the film was being made, story, image and sound coming together in harmony: in places action predominates while in other places music and in particular songs are used to add texture to the cinematic experience, offering us another perspective or way of viewing the diegetic world. For the US release, the group localised the songs into English. Makoto also uses silence effectively, both in terms of sound and image, which punctuates the narrative at climatic points. "Your Name" balances the multi-faceted components of the cinematic image to produce something which goes to the generic limits of the body swap genre in order to comment on both natural and man-made disasters and our accountability for the world in which we live - it is important to keep in mind that this was made after the Fukushima Dai-Ichi nuclear plant disaster initiated by the Tohoku earthquake (11th March 2011) and the ensuring tsunami (whose impact is still being felt in contemporary Japan as radioactive water is still leaking and will do so for the foreseeable future). At the same time, visual signifiers of the atomic bombing of Hiroshima and Nagasaki are ever present articulating the intertwining of past, present and future, that is key to the overall structure of the narrative. This is also expressed through the art of kumihimo (braiding cords) that Mitsuha's grandmother teaches her. In kumihimo, strands of coloured thread are braided together to produce a sacred rope; here the sacred rope is that which unites our two protagonists across time and space blending the corporal with the spiritual and the material and metaphysical dimensions of lived experience. As such, "Your Name" both aesthetically and thematically suggests that the spiritual still lies within the neon lights of our digital lives and should be embraced in order to fully be in the world rather than apart from it. 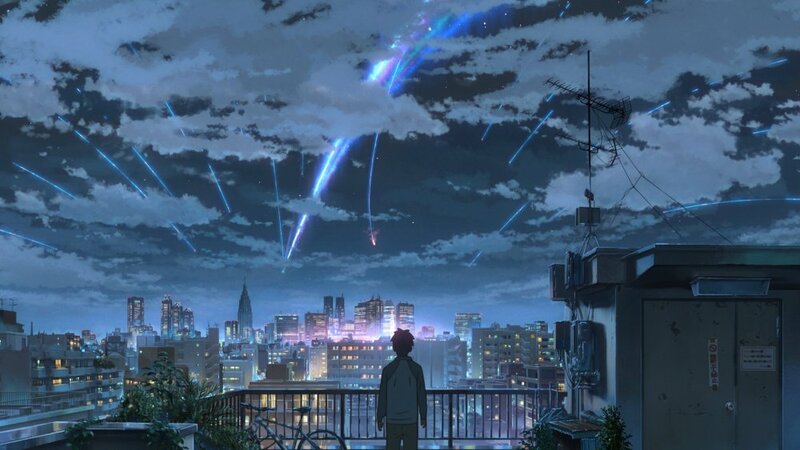 "Your Name" is one of the best films that I have seen this year. "Your Name" is an experience, an emotional, haptic and visceral journey through time and memory that grabs your attention and doesn't let you go until long after the final credit has rolled. I would recommend seeing it in IMAX, which is how I saw it, and is the way in which I think it should be seen.